Are we living in the experience economy? 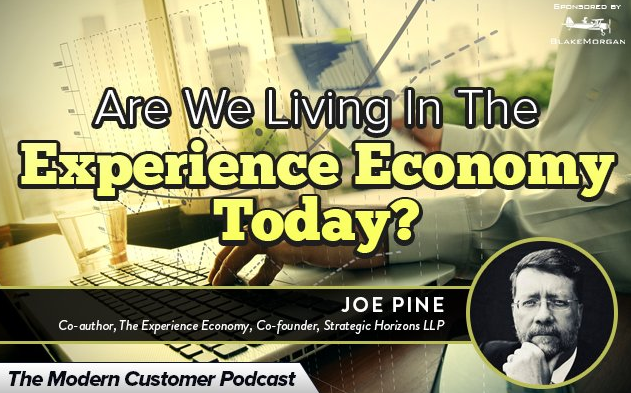 In today’s episode of the Modern Customer Podcast I interview Joseph Pine, coauthor of The Experience Economy – a book that predicted we are living in the Experience Economy. The book was updated and re-released—and almost 20 years after its initial publishing it still provides excellent fodder for the customer experience conversation. It was the original book to hit on the subject of customer experience. The book provides a well-researched discussion of how businesses won’t survive by doing what they’ve always done. Businesses must look to some of the major inspirations such as Disneyland, Hershey’s Chocolate World and other exciting experiences to engage the customer. To simply provide a product or service is not enough. In this podcast we revisit the principles of The Experience Economy. We see how businesses stack up today when it comes to providing the ultimate experience as defined by Joseph Pine in his book. What is a customer experience according to The Experience Economy? Are we living in the experience economy today? What can businesses do across their business to improve the customer experience?